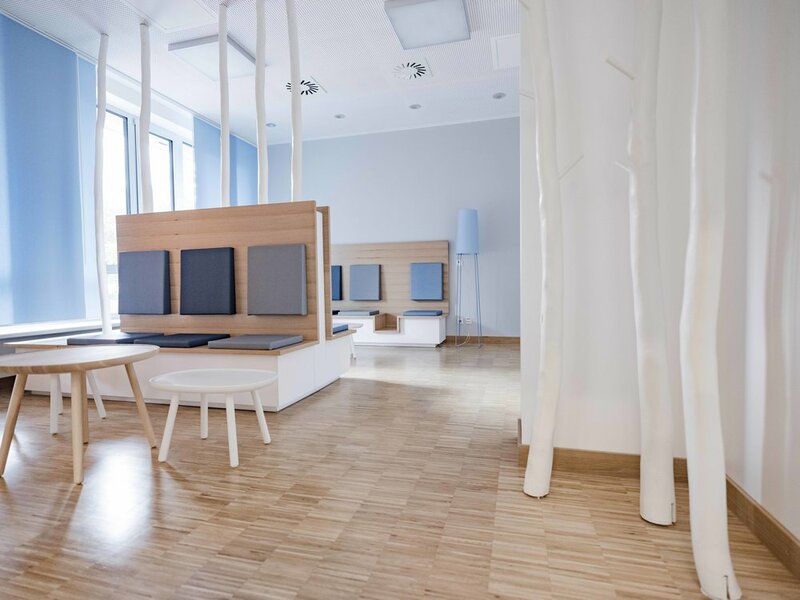 During the construction of the new children's hospital, the clinic management paid particular attention to the quality of the common rooms, as the young patients often have to exchange their familiar environment for a longer period of time for the premises of the clinic. In addition to the treatment rooms and patient rooms, the new clinic concept includes a large number of common rooms that CUBIK³ has commissioned to design: a large room with a stage, parlors for the parents, waiting areas and a "room of silence", which serves as a retreat and invites reflection , Furthermore, recreation, play and also classrooms for different patient and age groups with various requirements for safety and hygiene. The rooms cover all four floors of the new children's clinic and it was tried in as many areas as possible to create visual relationships with the adjacent park or the old hornbeam, which is in the center of the larger courtyard. Our approach was to create a temporary home. Creating a positive sense of space with colors and materials. The built-in possibilities to create, but without too concrete and thus leave room for imagination. To offer the children spaces in which they can play and learn together, but also find opportunities for retreat and relaxation. 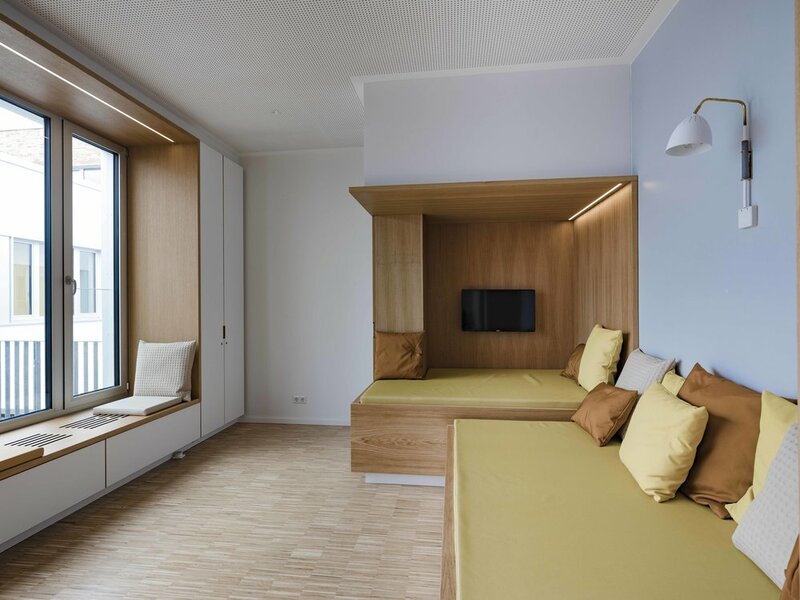 The rooms were designed according to different age groups and requirements, with the design features permeating. Die Jugendräume werden durch eingestellte Container zoniert. Auf den großen Monitoren gegenüber der „Tribüne“ können gemeinsam interaktive Videospiele gespielt werden. In allen Aufenthaltsräumen wurden die Fensterbänke von uns durch große Fensterrahmen ersetzt, die Sitzmöglichkeiten bieten und die Ausblicke einrahmen. Die Rahmen finden sich in anderer Form mit integrierter Lego-Wand oder auch als Tafel wieder. Layout and Design Concept in collaboration with buerokorb GmbH. A sensitive light and color concept as well as a sophisticated orientation- and singnage system were essential for this project.